The global speech analytics market was valued at USD 0.81 billion in 2017, and is expected to reach a value of USD 3.69 billion by 2023, at a CAGR of 28.82%, during the forecast period (2018-2023). The scope of the report is limited to deployment type offered by major players, which involves on premise, and on demand. While the end-users considered in the scope of the report include Retail, Banking, Telecommunications, Travel & Hospitality, Utilities, Healthcare, Government, Entertainment & Media. Speech solutions have the ability to convert call recordings to actionable data, and then translate the data into valuable insights effectively, across the enterprise. These solutions can handle a broad range of customer interactions. Speech analytics solutions are gaining immense importance in enterprises across the globe, since the conventional text-based analytics solutions are not effective enough to handle complex business issues in real time. Speech analytical solutions have the ability to enable users to gain insights, to make key business decisions, by providing deeper and faster analysis of voice - data, with context and relevance, across multiple channels. Enterprises have implemented speech analytics through a combination of internally recorded data, social media, as well as external syndicated data, to create cutting-edge analytics solutions in order to gain a better understanding of their customer requirements. The original pioneers in speech analytics, such as Utopy, CallMiner, and Nexidia. CallMiner and Nexidia are still operating as standalone companies focused on this niche. While Utopy was acquired by Genesys, that brought speech analytics into a much broader contact center technology suite. In today’s technology-driven world, data is considered as one of the cornerstones of decision-making, in organizations. But, with large chunks of data acquired through surveys, web traffic, social media platforms, and call center logs, it is difficult for companies to know what information to use to build strategies, to gain and retain customers. Thus, the need to monitor and analyze customer related data, and leverage the benefits of analytics to take proactive measures, to create a strong competitive advantage and build an exceptional customer experience. Consumer behaviors and needs are changing, channels of communication have moved online, and to mobile, social and digital, and thus are the challenging traditional approaches, to cultivating brand loyalty, and fueling price competition, and other competitive pressures. Further, the traditional text analytics have not been able to provide a deeper understanding of the customer needs and sentiments, with speech analytics able to overcome these shortcomings, it presents a promising opportunity to gain better insights. Call centers have been able to leverage these insights as speech analytics mines and analyzes audio data, detecting emotion, tone and stress in a customer's voice. And, also helps identify if a customer is getting upset or frustrated. This allows the customer executives of the company to quickly identify a customer's requirements and expectations, and gauge how to best address these issues. Speech Analytics has become increasingly popular in the telecom industry, due to the huge amount of data being generated through the advent of the connected world concept. Initially, the recorded calls were evaluated manually, but the rise of call volume is demanding the need for adequate and accurate evaluation, thereby leading to the adoption of speech analytics. Telecom service provider organizations are major end-users of speech analytics solutions, worldwide. Various benefits, such as increased margins, fraud reduction, risk minimization, service improvement, and customer satisfaction are leading to the acquisition of more customers, and retention of customers, which are aiding the growth of the market in the industry. Particularly, cloud-based communication analytics are being adopted by organizations, which help identify potential risks with real-time insights into customers; it can identify high-value customers and manage them accordingly, across the customer life cycles to improve revenues. The telecommunication segment accounted for a significant market share in 2016, capturing over 22% of the entire revenue share in the same year, which is majorly due to the integration of speech analytics into enterprise systems to enhance efficiency, as well as customer experience. 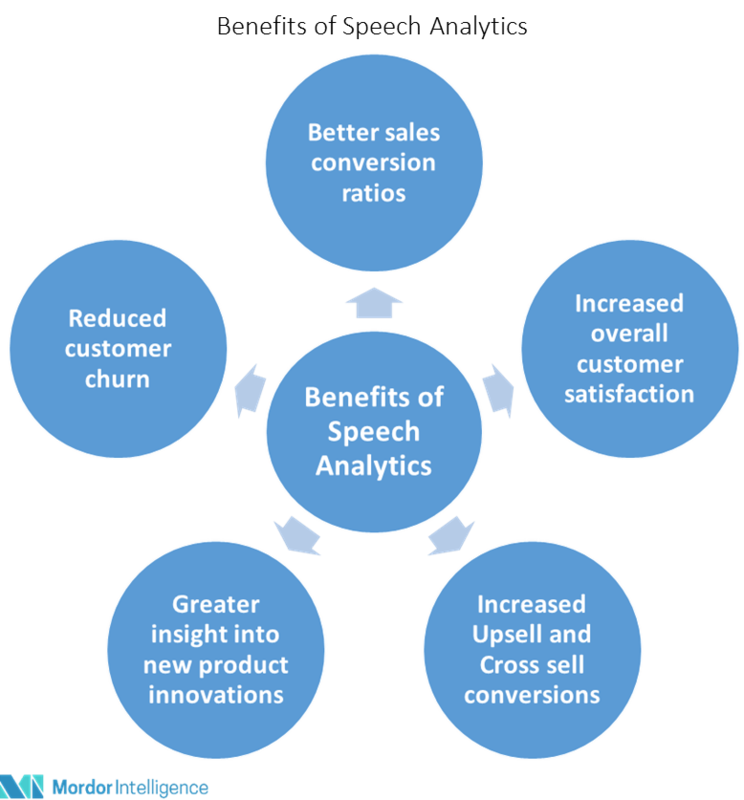 The US speech analytics market is driven by factors, such as increase in digital marketing spending, Central Intelligence Agency's increased technology spending, and increased focus on treating mental illness in the region, among others. Marketing expenditure in U.S has been decreasing for conventional forms of advertising, but budget for digital marketing has been increasing exponentially. Digital technology has constituted about 36.8% of the total advertising expenditure owing to an increase in smart phone usage in recent years, which has emerged as the primary source of infotainment for majority of the population. Such rise in digital advertisement technology budgets in U.S have encouraged the use of speech analytics technologies to further enhance the consumer experience by providing the consumer with more targeted product offers, which in turn increases the sale of products for companies. It has been reported that on an average about 1 in 5 of the American population suffers from a mental illness. Many mental illnesses do not have proper analytical tests to conclude a particular behavior among the patients. Major Players: Verint System Inc., Nice Ltd., Avaya Inc., Micro Focus, Genesys, Callminer Inc., Mattersight Corporation, Raytheon Bbn Technologies, Calabrio Inc. and Voicebase Inc., amongst others.